“Fresh from Spain” might be a more appropriate title for this post, which highlights my favorite winter fruit…the clementine. I know that eating clementines in such large quantities does not win me locavore points with Barbara Kingsolver, author of Animal, Vegetable, Miracle. However, I find that a clementine a day (at minimum) shields me from the germ factory* in which I work. We used Murray’s chicken breasts for this recipe, which I sliced in half so they would cook more easily. Murray’s chicken comes from Lancaster County, Pennsylvania. What I like about this chicken is that each package comes with a Farm Verification number. You can type this in, and find out exactly which farm. My number 2631 gave me 2 potential farms. Feel free to check it out at Murray’s Chicken website. Mix together 1/2 cup soy sauce, 1/2 cup orange juice or clementine juice, garlic cloves and ginger and pour over chicken breasts in a shallow dish. Refrigerate and let marinate at least 30 minutes. Heat griddle over medium heat and grill chicken for 6 minutes each side until juices run clear. While the chicken is grilling, mix together remaining soy sauce, orange juice, honey, ginger and rice wine vinegar for the dressing. Slowly add the olive oil while whisking until oil is incorporated. Slice the chicken into thin strips. 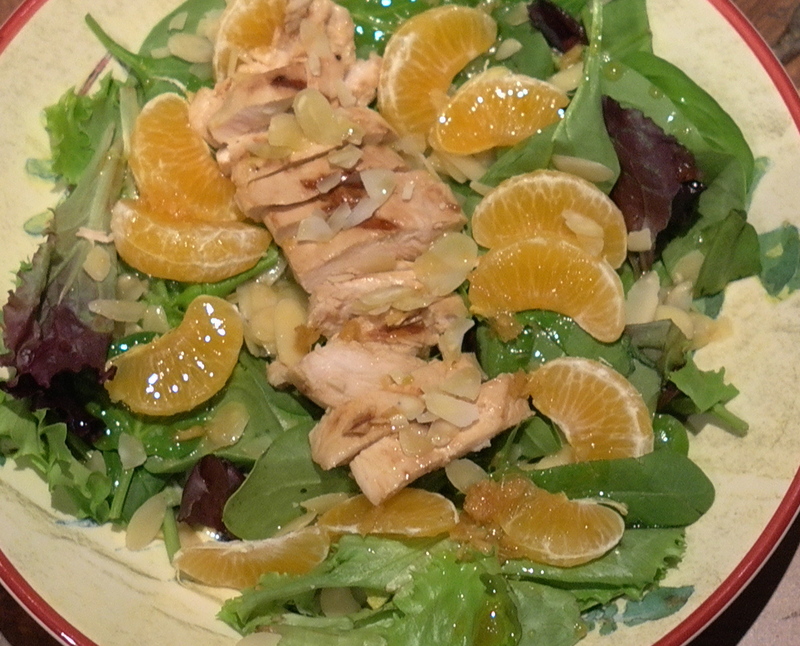 Layer greens, clementine sections, almonds and chicken, topping with desired amount of dressing. This recipe from Cooking Light’s September, 2011 magazine was great for dinner and then even better for lunch the next day. I’ll admit that my “drizzle” turned into more of a thicker sauce. It may not have looked as pretty, but it tasted delicious. For those who missed the memo: yes, I am eating meat. I can hardly believe it still myself. To make this vegetarian, use chickpeas instead of chicken. The recipe called for chicken thighs. I got this chicken at Forager’s in DUMBO, where they get all their meat locally. They also only have chiken breasts, so I used those instead. 1. Combine 1 1/4 cups water, 1 cup bulgur, 1 tablespoon olive oil, and 1/2 teaspoon salt in a medium saucepan; bring to a boil. Reduce heat; simmer for 10 minutes (do not stir) or until the liquid almost evaporates. Remove from heat; fluff with a fork. Place bulgur in a medium bowl; let stand 10 minutes. 2. Heat the remaining 1 tablespoon oil in a large nonstick skillet over medium-high heat. Add chicken to pan; sprinkle with 1/4 teaspoon salt and black pepper. Sauté for 4 minutes on each side or until done; shred chicken. 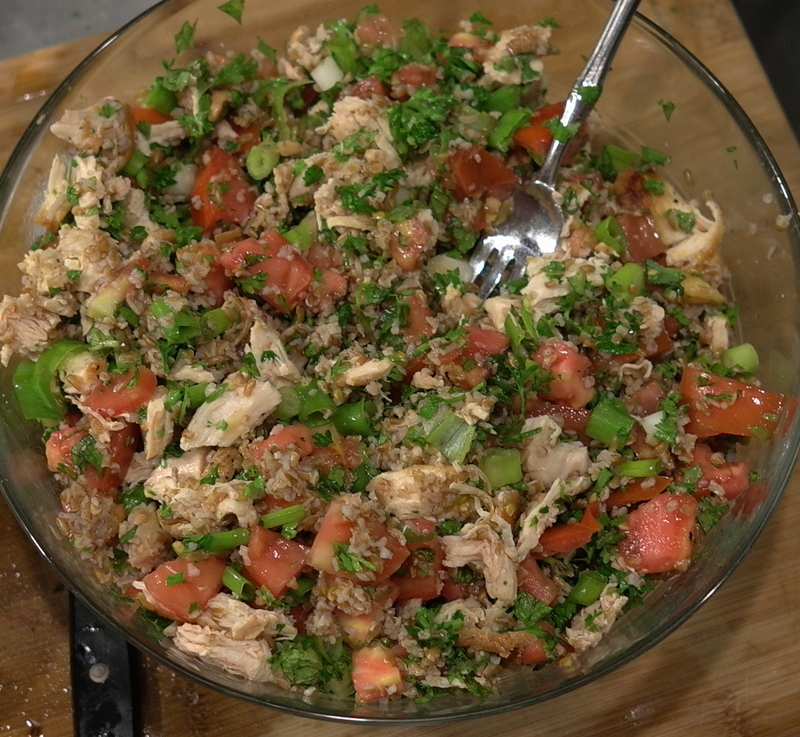 Combine bulgur, chicken, tomato, and next 4 ingredients (through garlic) in a large bowl; toss gently. 3. Combine remaining 1/4 teaspoon salt, tahini, and remaining ingredients in a small bowl, stirring with a whisk. Drizzle over salad.